On a side note, Chloe enjoyed “Beauty and the Beast,” but for about the first 20 minutes of the scenes with the beast, she whimpered that she wanted to go home. She became less afraid of him and finally warmed up to the idea of watching the entire play. Then, toward the end of the play when Gaston and the beast were fighting and when the beast turned into a prince, Chloe cried and cried. She cried until the end of the play, and she continued to cry until we were out of the theater. That child was one emotional wreck! It really amazes me that a three-year-old can be that sensitive. Thank you Ninnie for treating us all! Now, back to Father’s Day…. I know this is going to be taken the wrong way, but I mean it in the highest of compliments. I never knew how great of a Daddy Matt was going to be. Chloe and Cole’s daddy amazes me at the father he is. He was raised right, and because he has one of the best Dad’s in the world, he has become the best Dad in the world. I could never do my job if it wasn’t for Matt helping me along the way, and we appreciate everything he does for us. He has been traveling a lot lately, and I know it’s hard on him being apart from Chloe and Cole (and hopefully me), but he makes up for it when he is home, I assure you! So, thank you Matt for being the great father you are to our two babies. I do think you are the best Dad in the world, but I must say, you are tied. You are tied for first place with my Dad. I know how a father should be, and I know how a father should raise a family because I witnessed my dad do it the correct way. I am incredibly, incredibly lucky to have the Dad I have, and I’m incredibly, incredibly lucky to be surrounded by such great Dads. I have both of my grandfathers, my husband, my father-in-law, my dad, and now my brother is about to become a Dad. Great Dads are all around me, and Happy Father’s Day to you all! This is just one of those silly things I wanted to catch on video (and it’s not the best of videos, but it gets the point across)…. When we tell Cole we love him, which is very often so you would think he would learn, he replies, “Thanks.” We’ve worked trying to get him to say, “I love you” back, but instead he just answers, “Thanks.” Cracks us up! I’ve said it over and over, but WOW. Life with one child is so easy. Actually, I shouldn’t say that. 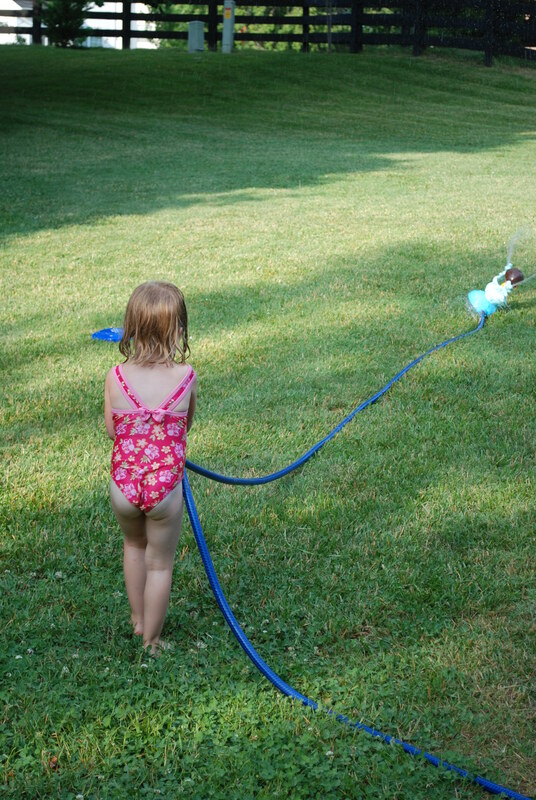 I’ll rephrase that….. Life with one child is so much easier. Not easy, but easier. Maybe I should instead say not as hard. Chloe has been at Mom and Dad’s all week attending VBS and swimming lessons. She has had a full week! But, it’s been me and Cole for a couple of days before he went to Matt’s parents. He went there for 3 days while I worked in the kitchen. But, when I did have just Cole, everything was easier – waking up, eating, running errands, cleaning, bath time, bed time, everything! It’s amazing how much more gets done when I just have one child. While that may sound like I’m wishing for the “good ol’ days” of the simpler times, I’m not! Chloe and Cole are really starting to play well (and fight well) together. This has been going on for a while now, and it’s great. I love when they make each other laugh genuinely. It is the sweetest sound to my ears. They can make each other laugh harder than just about anyone else, and it melts my heart. I’m so glad they have each other, and now I’m really starting to enjoy how close they are in age. When Chloe was away this week, Cole would run into her room and yell for her. He would go to the stairs and yell up the stairs looking for her. He would go up to her pictures and carry them around and yell for her. He missed her so much. And when Chloe got home, she had a present for Cole. Mom said they were shopping one day and she said she wanted to get a gift for Cole. So, so sweet. I remember when I was pregnant with Cole, so many strangers (and friends) would see Chloe and say, “Whoa! What’s their age difference going to be?” And when I answered, “20 months, ” I got many different reactions, but I was always told, “You will really enjoy them being close in age down the road.” And I am. I know it’s going to continue to get easier and better, and even though our life is extra crazy right now (and has been for 20 months), I’m glad Chloe and Cole are best buds. 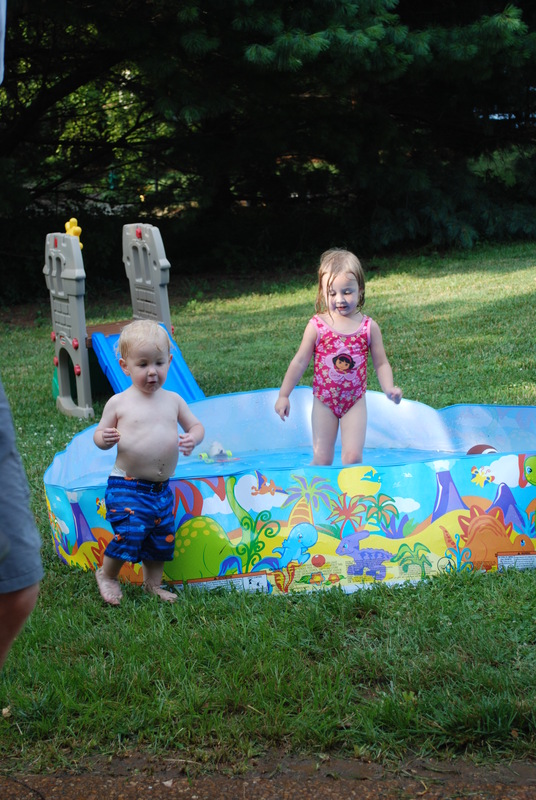 Cole is now 20 months, and to think that was the age Chloe was when he was born…. well…. that just about makes me break into hives! 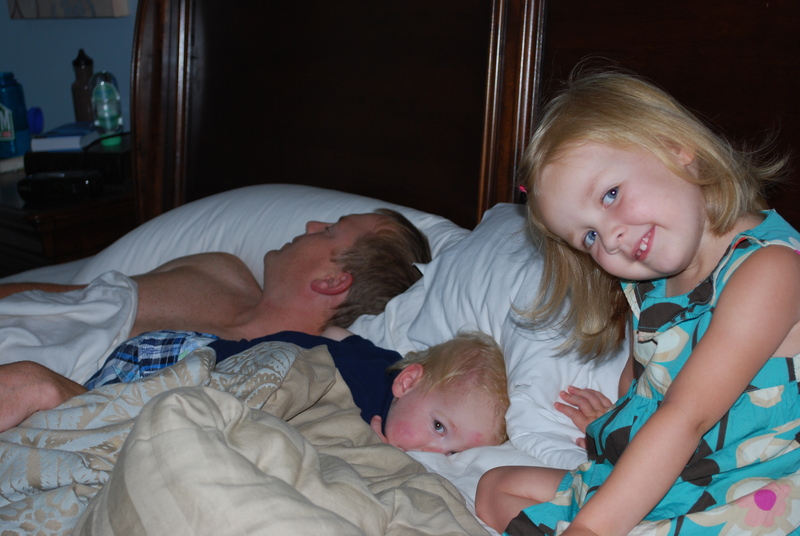 How did we ever survive a newborn and a 20 month old? I guess we knew no different. I often hear parents with one child/baby say they are afraid to have more children because they don’t think the second child could compare to the first, and they just don’t think they could love a second child as much as the first. It’s totally fine if parents just want one child. Nothing wrong with that AT ALL. But, if it is for the reasons just mentioned, that makes me chuckle. It’s just the same…. that love. It’s just as strong and crazy and amazing and immediate and fierce. I guess your heart must grow to be able to love like that again (and again). If I had more sanity, patience, energy, time, money, and maybe a chef, personal assistant, and a couple of nannies, I would have a house full! We are very fortunate to have some really great parks close to us, especially a really great one right down the road. This specific park was actually underwater for a few days because of the flood, but it is now back up and running. Tonight was “Movie at the Park,” and I thought it would be right up Chloe’s alley. She is really getting to where she loves watching movies, so I figured she would thoroughly enjoy this event. The movie didn’t start until dark, so it was after 8:00. That is Chloe and Cole’s bedtime, so we allowed Chloe to stay up extra late for this and had a babysitter for Cole. Well…. the night didn’t go exactly as expected. Chloe had nooooo interest in the movie. All she wanted to do was play on the swings/slides/playground equipment. 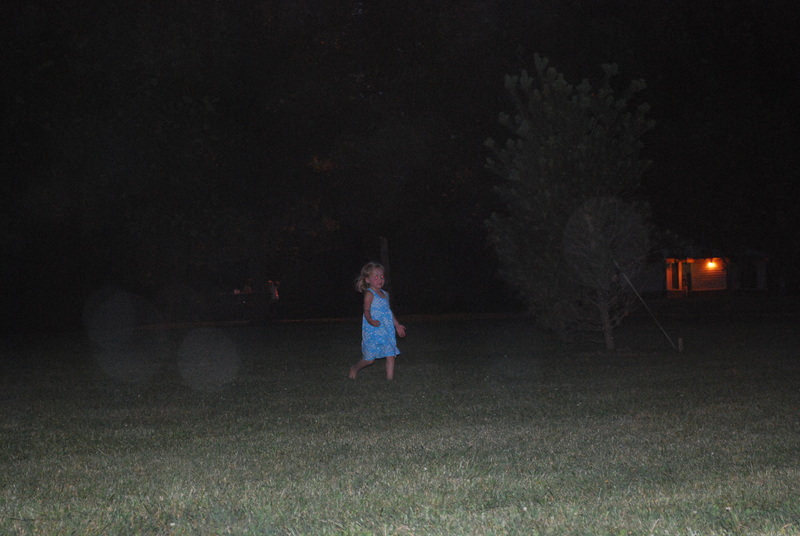 We let her play until the movie started, but then it was just dark enough to see every single lightning bug. And, there were a ton on lightning bugs. The only thing that interested her was chasing after them. Now, to the right of where Chloe is chasing fireflies in this picture, there is a huge outdoor movie screen, and there are approximately 2 to 300 hundred kids and parents laid out on blankets with picnics. All are enjoying the movie. Except us. Chloe had no interest. She did walk back to us with an egg that must have fallen out of a nest. We were looking at it when she accidentally crushed it (it was already broken), and it was the nastiest smell ever. It was all over her hands, so we sanitized her best we could. We ended up leaving before the movie was over, and that smell lingered until we got Chloe home and cleaned up. Yuck! So now, we have no interest in making it back to the next park movie. Maybe next year it will keep her attention more. To say we are having a hard time getting Chloe to stop sucking her thumb is an understatement. We are having a H.O.R.R.I.B.L.E time trying to break her habit. We do have some polish that keeps her from sticking her thumb in her mouth, but I feel it’s a little cruel. You can’t even buy this stuff at the store, and I think I’ve seen a pattern to where it hurts her tummy. Mom and I both tried it, and it was awful. We could not get the taste out of our mouths for hours. Seriously. Hours. 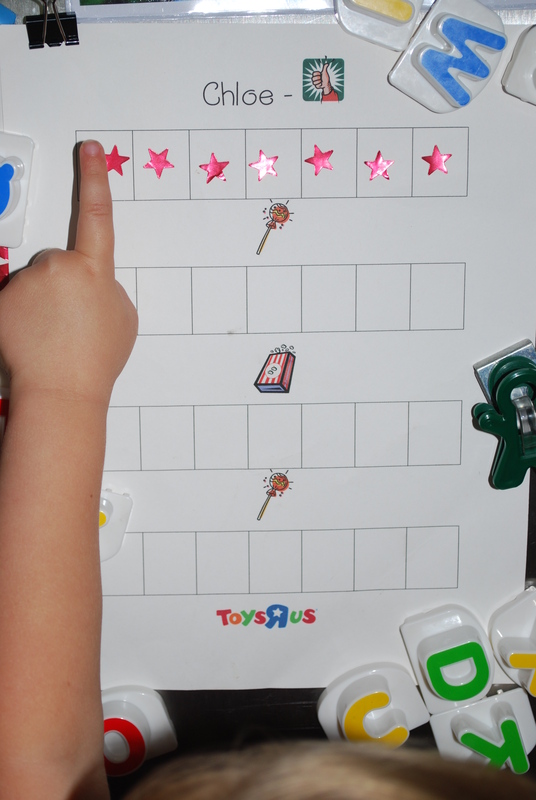 We’ve started an incentive chart, and she gets a star every time we “catch” her not sucking her thumb at a time when she normally would (riding in the car, watching tv, napping, etc…). She has filled up the first row on the chart! 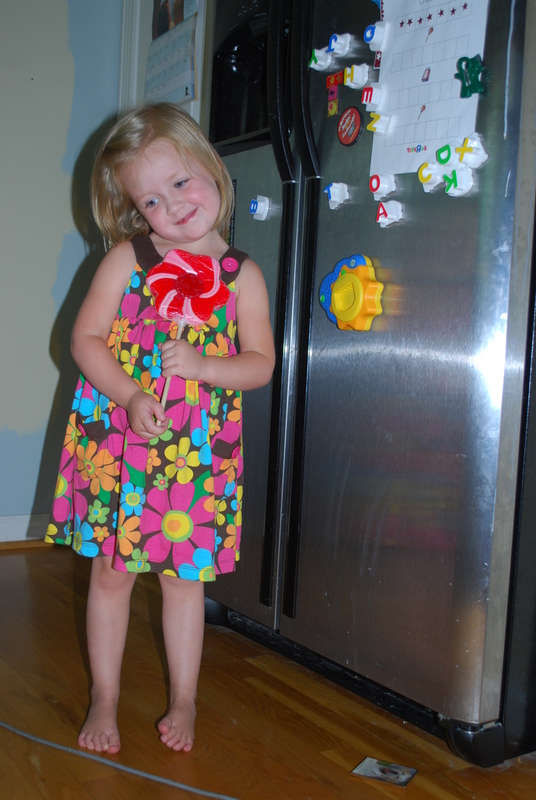 So, now Chloe gets to go shopping and pick out a lollipop (a reward of her choosing). We went to Cracker Barrel because I thought they would have a good selection, and boy did they! Chloe was in lollipop heaven! She found a pink/red flower lollipop and couldn’t have been more excited! Chloe has really gotten into being a “mommy” lately. She takes very good care of her baby dolls by feeding them and putting them to bed. Also, she likes to pretend that Cole is her baby. Surprisingly, he cooperates. 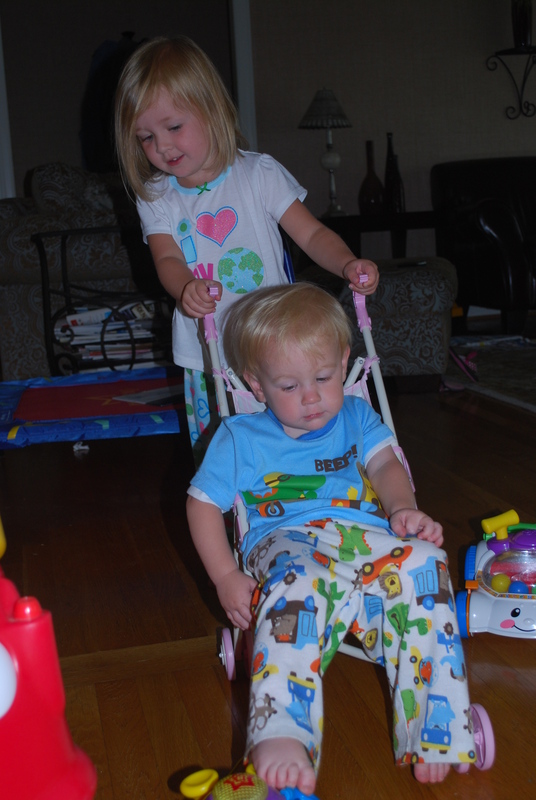 They both work extra hard to squeeze Cole into the toy doll stroller, and once Cole is in, Chloe pushes him around the house. He has to hold his feet up so they don’t hit the floor. I don’t know how he doesn’t fall out.